Featuring the poetry of Bruce Lansky and other children's poets. 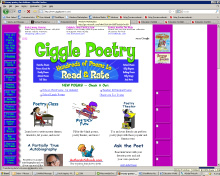 Giggle Poetry is a fun resource for would-be young poets that features the poetry of Bruce Lansky and other poets. This site is vibrant, colorful, and engaging, with such activities as Read & Rate and Poetry Fun. This well-organized site is easy to navigate from the left side menu. Giggle Poetry, as the name suggest, approaches poetry with a sense of humor. Poems from Bruce Lansky and other poets are archived for students to enjoy reading or to use as examples. 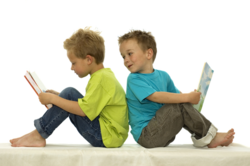 Included are fill-in-the-blank poems, poetry contests, favorite poems, school poems, and more. Teachers will love the easy-to-follow instructions for writing limericks, nursery rhymes, and list poems. These could be used as a supplement to the writing curriculum. The site also provides poems to read and rate whether they should be published. A special Poetry Teachers section includes information on how to teach students to write poetry, poetry that students can perform in class, and fun activities to involve students. This site is sure to put a smile on your face and a giggle in your heart.